UMBC doesn't have a marching band. It's never needed one, at least not for the traditional reason, as we have no football team. But a simple plan to make us mobile over a decade and a half ago has grown in a big way. Sixteen years ago, I was entering my senior year at UMBC. I had been given the go-ahead by Athletics to purchase some field drums, allowing the usually stationary pep band to move. 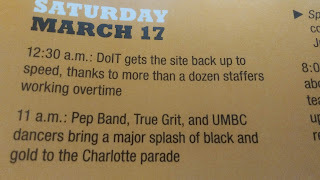 Typically bound to a drumset, the then-less than five year old Down and Dirty Dawg Band was increasingly called into action for university events - sports beyond just basketball, pep rallies (usually for the chess team) and other activities. We started with a bass drum, two snares, a set of quads, and a pair of cymbals, if memory serves me correctly. Living on campus that summer, I had the pleasure of unboxing them and putting them into play for the first time. In our first year, they were put to good use. The entire pep band marched in the inaugural Homecoming parade. An ad-hoc drumline performed at FunkFest, a collaborative program put on by many of UMBC's black student organizations. In the years that followed, the drumline has grown, bother in size and stature. 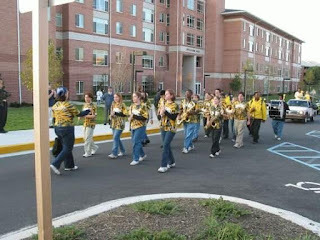 They perform, both independently and with the pep band, at UMBC games and have become an integral part of the gameday experience. Mobile gigs and parade, including Catonsville's 4th of July parade, are now standard. 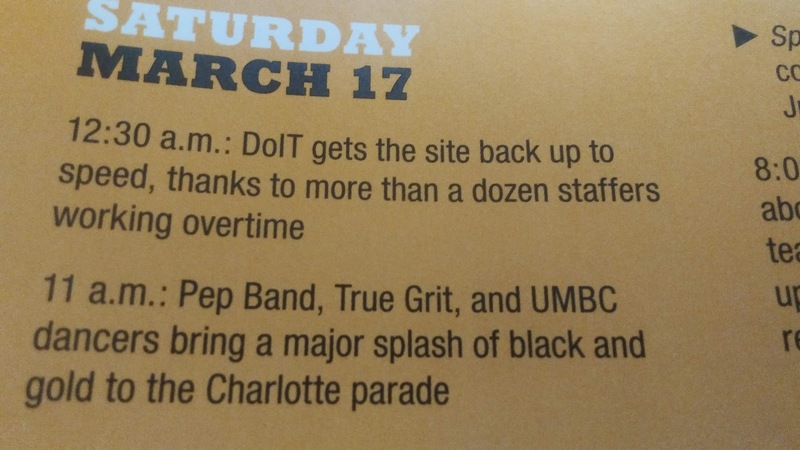 As UMBC made history in the 2018 NCAA Men's Basketball Tournament, the UMBC contingent in Charlotte got to add to their (admittedly unexpected) extended stay by marching in the St. Patrick's Day Parade. Never in my wildest dreams could I have anticipated that a modest move to get us in motion would have led us to capitalizing on the biggest victory in men's NCAA Tournament history in such a cool way. Proudly we hail to thee.